A beautiful morning at first but it clouded up a bit at lunch time. 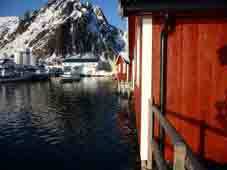 We were now in the Lofoten Islands. 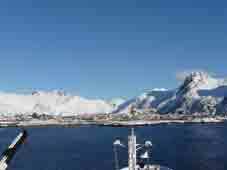 They had lowered some of the life boats to ferry us ashore at Svolvaer, as the harbour is too shallow for even a small cruise liner like the Marco Polo. We had a walk all around this not very attractive town with too many poor modern buildings but I think we saw all older stuff there was to see & the best modern was good. The setting is magnificent & the best view of the front obtained by walking through a 'No Pedestrians' sign by the ferry terminal. We took the bum boat back for lunch. 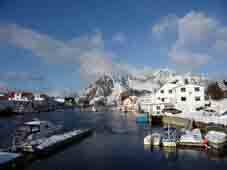 After lunch, we were on an official tour to Hemmingsvaer, an attractive little village at the end of a string of islands West of Svolvaer but with the Lofoten House Gallery. 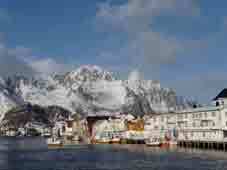 We left Svolvaer in weak sunshine but were in a blizzard when we got to Hemmingsvaer. We sat through a well-done audio-visual show that tried to sentimentalise the hard life of the islanders & then, went round the gallery. This was full of 19thC style representational art only some of it was produced fairly recently. The Sun was back out when we left the gallery but there was a foot of new snow on the ground. We had a good look round the village before heading back to Svolvaer to inspect the fishermen's huts, designed as specified by some old king, as they had been turning their boats over & sleeping under them. 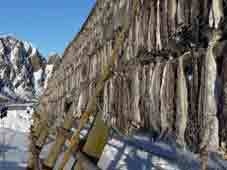 We looked at some drying cod (Stockfish) on the racks they use here. 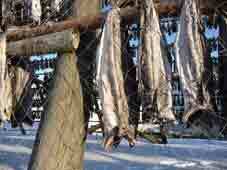 The courier assured us that this is the worst Norwegian winter for 70 years. Then, the bum boat back to the Marco Polo. Dinner was in Marco's Restaurant, as we were too late for the 'Waldorf'. Marco's is self-service & much more informal. We watched a group of self-styled post-menopausal ladies called the She Three in the Marco Polo Lounge. They were good & very entertaining, unlike most of the shows there but do not appear to have a web site I can link to. 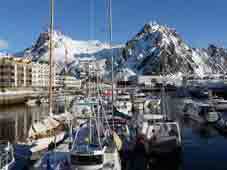 URL: http://www.art-science.com/Tourism/Norway/NC/NC4.html Last revised 1/4/2010 © 2010 Ken Baldry. All rights reserved.